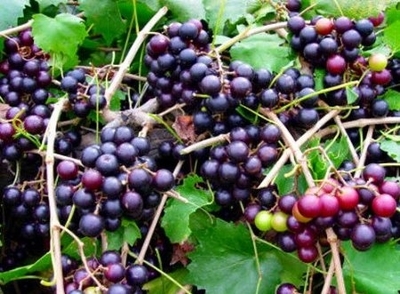 Pollinater necessary Premier fresh eating and wine grape Largest black grape is sweet and juicy. Hardy Zones 7-9 (zone 6 if protected) Small starter plant in 4" pot. Muscadine Grapes These spicy-sweet thick-skinned grapes are an old Southern favorite and are found growing wild throughout the lower South. They thrive with little care, and the vines can remain productive for 100 years! Modern breeding has brought us a wonderful range of varieties: wine grapes for the home vintner and jelly maker, plus delicious fresh-eating varieties, some as large as golf balls! Jumbo As its name implies, Jumbo is a very large, black muscadine grape. Its great taste becomes sweeter as the fruit darkens in color to full ripeness. Popular for making juice and wine as well as fresh eating. Jumbo vines are vigorous females that require a pollinator variety. Sugar content 15%. Largest black grape is sweet and juicy. Hardy Zones 7-9 (zone 6 if protected).